Everlast Floor has a textured finish. It is made with small natural marble stones. In some applications, such as in a commercial kitchen, an additional grit is added to the glaze coat giving it added slip resistance. Different applications require different levels of slip-resistance. 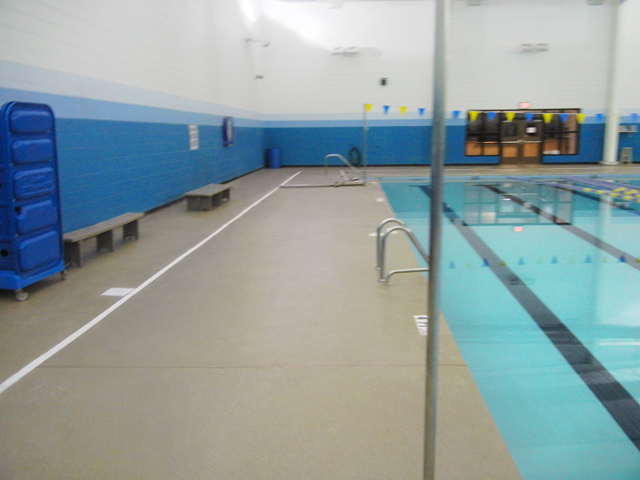 Everlast Epoxy Flooring has a textured finish that creates a slip-resistant flooring. It has a coarse, pebbled, ribbed, but non-abrasive surface. In areas which will not be constantly wet, no additional grit is needed. When installing Everlast Floor in frequently wet areas, we offer an aluminum oxide grit to blend into the glaze coat to give the floor a sandpaper like finish. This gives excellent slip and fall protection, even under wet conditions. Restaurant and foodservice floors are often coated in grease and oil, making them prone to slip and fall accidents. Adding our non-slip additive in the walking areas will create a safe workplace. In your hurry to get a new floor installed, don’t “slip up” and get stuck with the wrong floor. I’m sure that you well know that a slip can really pack a wallop on your cash flow. The medical costs and lost business due to injured employees can add up.